-Region 12 Arabian Championships, our first and a SWEEP! (Charisma's very first Dressage show, just 3 months U/S- 83% at W/T! Charisma has been by far, the easiest horse I've ever been blessed to start with. She out grew her fiery ways as a foal to become an outstanding, talented competitor. She' still has some sass though! From the time I first sat on her back, she always did what was asked of her. After just shy 1 month U/S, at the age of 3 & 1/2, I decided to take her to a local show for mileage and she won every class she entered, including X rail jumping... of which she learned THAT day! This was one of MAN Championships. Her next competition was a USDF Dressage show at Introductory level where she received whopping scores of 83% and an 81%! Her third competition, and only 4 months U/S, she entered her first A rated Arabian Show at the Florida Thanksgiving show and blew the competition out of the water! She won her Sport Horse U/S Jr. horse class easily and was Jr. Horse Champion, then went on to win the Sport Horse U/S OPEN with extended gaits! I remember floated by the competition at the trot with her thanking God for such a fabulous young mare, and she demanded the Open Championship as well. She also won both of her Training Level Dressage testes with scores in the upper 70s (nearly 8 points above the rest) and captured Training Level Champion as well! Charisma and went to another USDF Dressage show at the very competitive Clarcona circuit in Florida, and again, the little half Arab mare gave her all, and was 1rst and 2nd in her classes. She gave me a wonderful birthday weekend in January claiming Half Arabian Sport Horse Jr. Horse and Open Championships, and again the Training Level Championships. The next two Arabian shows I took her to, were duplicate shows as well. Never losing a class. I remember all of my Arabian comrades telling me not to get my hopes up at what would be both mine, and Charisma's first Regional Arabian Championships with her not being U/S a year. We both took the Championships by storm by claiming each one she entered. She was Region 12 Junior Sport Horse Champion, Sport Horse Open(against all ages of horses with several years training) and also Training Level Champion. In between all of our shows and practicing, Charisma has always been a blast to just play with in the field. Playing tag, teaching her to go get her stall ball, feeding her the number one favorite treat of hers, bananas, or just hearing her whinny softly when she hears my voice, laying against her in the stall as she is sleeping, enjoying many trail ride adventures, laughing and watching her play in the sprinkler in her paddock, she’s always a joy. Unfortunately, Charisma suffered a difficult to diagnose lameness a few months later while she was in the paddocks enjoying some off show season time. After several months not getting a full diagnosis on what the issue was, and a few thousand dollars later, I could tell she was done being poked and prodded, and decided to turn her out for a year. That was unfortunate in so many levels. Charisma was awarded her Legions of Honor that year as a 4 year old, the youngest horse at the time to do so in the Arabian Horse Association. 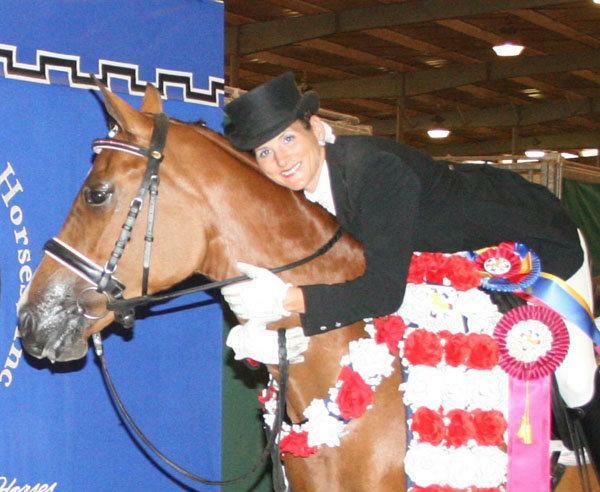 She also broke Arabian Horse Association records SEVEN times her first year under saddle by being the Youngest horse to win the Open Sport Horse U/S, The Youngest horse to win Region 12 Sport Horse U/S, the Youngest Horse to win Region 12 Training Level Champion, the Youngest Horse to be awarded the Legions of Honor. An Honor she was unable to attend in all her glory due to a Vet's poor decision in diagnosing her lameness and using what little funds I had in useless poking and prodding. I learned a valuable lesson through her pain, equine scintigraphy. If that Vet had suggested it, we would have known WHERE to start treating. The equine scintigraphy was about 1600.00... I could have saved thousands of dollars and pain and aggravation to the best mare I've ever had come in my life. In all, she won over 13 championships that year, and was only ridden 4 times a week, no more than 20-30 minutes each ride. She just didn't NEED to be worked. I met my competitive mach in the DRIVE to compete with her! What I wasn't prepared for, was my life falling apart and my having to make the decision to split from the family business and move to Louisiana for, what I thought at the time, was good idea. However, having just a 4 horse trailer, I decided the smart thing to do was bring the stallions up and my old gelding for lessons, and leave mares behind this trip. Needless to say, things did not work out as I planned, and Charisma had to stay at the farm in Florida much, much longer than I anticipated. When I made the long drive back after a year, it was 2 in the morning, I called to Charisma where she was out in her field, all I heard in return was her galloping while whinnying the whole way across her 5 acre paddock! I got my little "Disney" moment in real life when she slid in to the stall in the barn just talking and talking to me. I just wrapped my arms around her beautiful neck and told her how much I'd missed her, tears soaking her beautiful coat! They always say you have one horse in your life who captures your heart and soul, and Charisma and I have a very deep connection. I look forward to the day, very soon, that I get to ride her again and start her back in the show pen. It is something she truly loves to do. No matter how silly and baby she could be in a warm up, you could literally FEEL her pull herself together when she entered the ring to compete. Almost like she were saying, GAME FACE! Everyone who knows her, knows she's the Princess. She has the most amazing personality and heart and loves to play! I would play tag in the round pens at shows to keep her mind busy and free, which always caught the eye of onlookers, making them enjoy our little show. Charisma also does Spanish walk and bows. I truly wish my Grammy could have seen her compete. And in honor of the most important woman in my life, Charisma and I always have pink Breast Cancer Ribbon accents on our show attire every time we compete. My Grammy helped me acquire both Charisma's sire and dam, and without her, Charisma would not have been a dream made to reality. This is what a 9 halt looks like on a 4 year old... LOVE her! Sleeping at Tampa, I wish I could have gotten the shot where she laid back flat and fell asleep... nothing more comfortable then curled up against a 1000lb animals warm body when its cold out! She and her baby brother, Rivendell as Weaners.